Nothing affects modern society more than the decisions made in the marketplace, especially (but not only) the judgments of consumers. 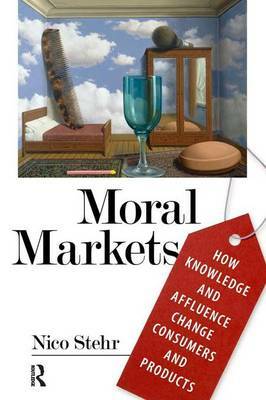 Stehr's designation of a new stage in modern societies with the term "moral markets" signals a further development in the social evolution of markets. Market theories still widely in use today emerged in a society that no longer exists. Consumers were hardly in evidence at all in early theories of the market. Today, growing affluence, greater knowledge, and high-speed communication among consumers builds into the marketplace notions of fairness, solidarity, environment, health, and political considerations imbued with a long-term perspective that can disrupt short-term pursuits of the best buy. Importantly, such social goals, individual apprehensions, and modes of consumer conduct become inscribed today in products and services offered in the marketplace, as well as in the rules and regulations that govern market relations. Stehr uses examples to illustrate these trends and build new theory fitting today's changing consumerism. "The most interesting book on the sociology of markets in recent times, one that deserves a wide audience across the humanities and social sciences. To those for whom society is a defunct idea, Stehr counters with an account of consumers in affluent societies as capable of bending the market to their collective will in ways that enable them to exercise the sort of power that in the past would have been treated as `political.' The book provides us with everything we need to decide whether this is a good or bad development. Stehr has succeeded in restoring a sociologically robust conception of the market." "Moral Markets constitutes a very innovative approach in the analysis of markets as sociocultural, strongly emphasizing the specific moral dimensions of markets in the contemporary scene, especially in relation to the expansion of knowledge, problems of biotechnologies, and the environment. A very challenging and important addition to the analysis of the contemporary scene that is highly recommended for sociologists, politicians, economists, and philosophers." "... a charmingly provocative analysis of the concept of the moralized market."